The church here has been going well. Now that the summer is past, people are not going to their villages/beaches as much anymore which means more steady attendance in church. Even Wednesday evening Bible studies have seen a few regular attenders. Even on nights when there are bus strikes or pouring rain, people still come out and that has been a tremendous blessing! 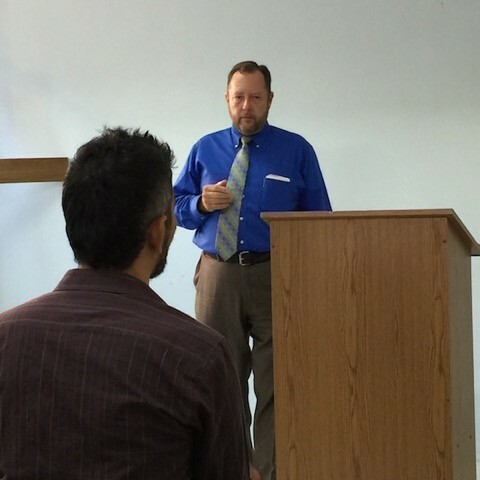 The church is currently made up of people from many different places – Holland, Sweden, Afghanistan, and Greece. Yet, even though some do not speak Greek and some do not speak English, the unity in service and fellowship has been a real blessing. 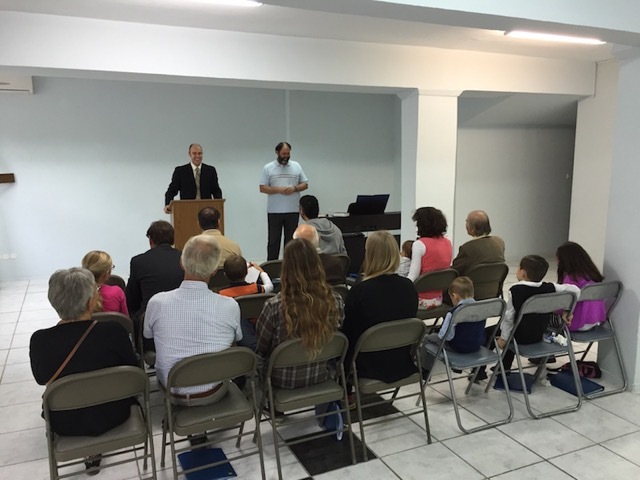 The family from Holland recently brought a visitor to church that was visiting from Holland to work with the Syrian refugees and they had been witnessing to him at home and the sermon the Lord had given to me for that Sunday was exactly in line with what they had been talking to him about. Please pray that God would continue to work in his heart! During one of the recent services, one of our men, Elia, gave testimony to how he was recently with a couple of refugees that were coming through here on their way from Syria to Germany and that he and a friend kept them with them for the night. They stayed up talking most of the night as Elia talked to them about Islam and how he got saved and gave them the Gospel and what the true Word of God is. He had translated a couple of my father-in-law’s tracts for Muslims a couple of years ago and he had remembered and used all of that material as he dealt with these two Syrian men. While they did not get saved, he was really excited about doing this on his own. Praise the Lord for his desire and boldness! Again, now that summer is over, things have gotten back to normal in the city as well. The crowds have returned once again and the tract distribution has been going well. Of course there are some that are upset and do not want to have anything to do with it, but that still works out for good. An example is this one older lady who insisted that I am not a Christian and she would take nothing less than my making the sign of the cross as “proof” of my Christianity. As I tried to reason with her, she continue to interrupt and proceeded to take a tract from my hand and tear it up before throwing it back at me and walking away, condemning me. When I bent down to pick up the pieces, a young lady who had been standing nearby bent down to help me and asked if she could have one. 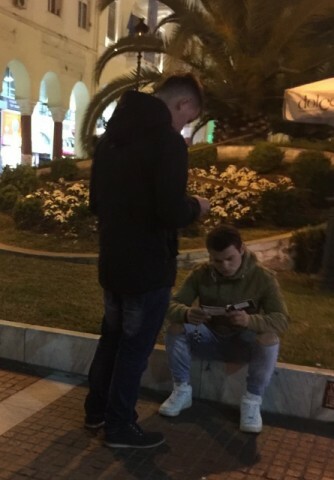 At the same time, two young men who had also been standing near asked for some as well and listened as I gave them all the Gospel. They did not get saved that moment but they thanked me and said they would read the tracts as they caught their bus. All three of those young people stopped to listen as a result of one other person’s rejection. Another incident was with an older man who approached me with a tract in his hand. He told me he had read it and it was very good. He said it had “great spiritual truths” within it and asked if he could have more to pass out to his friends. We started to talk and he said he is orthodox (which is what everyone here claims to be) but said he wants to talk about this some more and said he will come to church. We exchanged phone numbers and are going to meet to talk again soon. Please pray for Constantinos. 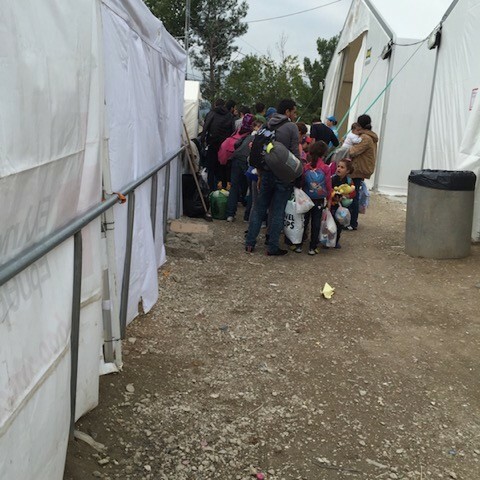 Another area we have been trying out is the refugee camp up near the border with Macedonia. 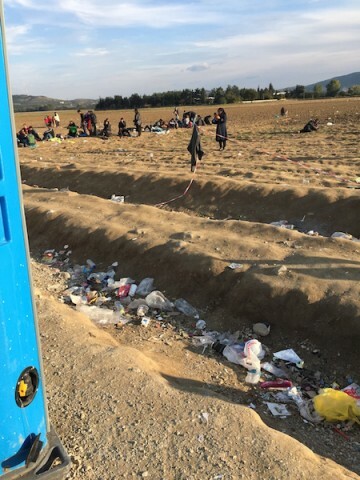 This is a place where tens of thousands of refugees come through in a week, sometimes in a single day, from Syria (and other countries in the Middle East) on their way to Germany and the rest of Europe. It is a UN-run camp but there is really no organization of any kind. The other day there were at least 5,000 people there at one time and the UN people only came out of their trailer when it was time to take a group over the border. The food and clothing areas are all managed by different volunteer groups. While I do not have the liberty to stand in a single place and pass out tracts, I have complete liberty to walk around and talk to people. This includes refugees and volunteers alike. I have been up there a few times now and have had many witnesses with some of the people that are there. Elia and I just started walking around to talk to people as they waited for their chance to cross the border. Elia speaks Arabic, Farsi, and Dari (the language spoken in Afghanistan) so it is a real blessing having him there! Even though these people are refugees, they are still Muslims with many of them still hating anything about Christianity. Being able to start talking to them one-on-one in their own tongue is a wonderful avenue. Thanks to a brother from church, we have access to some of the clothes that are being donated to this and other camps. 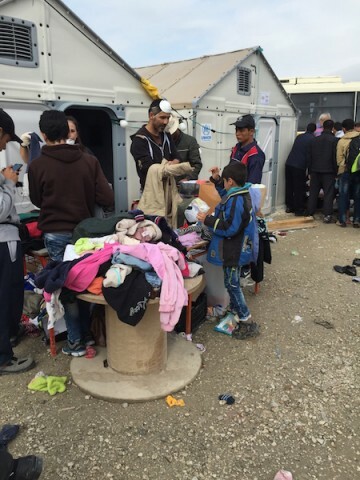 We have ordered more Arabic tracts to begin putting in these clothes before they get dropped off. This will allow us to reach many more of these people as they make their way through various points of Europe. Please pray for these efforts! It is truly heartbreaking to see the condition of these people and to know what they have gone through to escape their country. 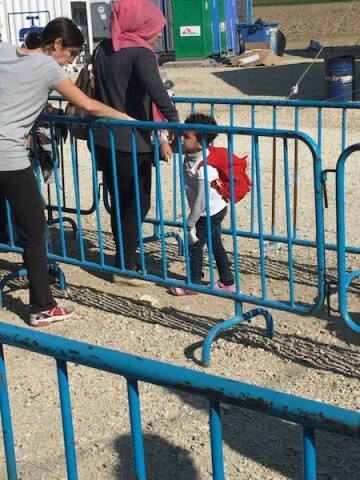 There are many families with children as young as a few weeks old that have gone across Turkey before getting on rubber boats to cross to a Greek island, put on ferries to Athens, and then on buses to where we meet them. There are volunteers from all over Europe that come to help here. While the physical needs need to be met and it is a blessing to see them get what they need, their spiritual condition is of far greater importance. These are people that are coming from Syria, Afghanistan, Iraq, and Iran and that may never have had opportunity to receive the Gospel message like we have with them now. Please pray for Constaninos, Ahmeed, Petros, and Mike. Our family is doing very well! We enjoyed the company of my father-in-law a few weeks ago and he preached a couple of the services while he was here. It was a blessing to get to go out with him during his time here. The children are back at school (at home) and doing well. Rachel is working with them on Greek as well and they are doing really well with their understanding of it. Our newest, Timmy, is growing and the joy of everyone who sees him! Our family is blessed to be here and we thank God for you all every day. We do not take lightly the time, prayer, and finances given to help us be here to support this church and share the Gospel with all of those around us.